In 2008, Canadian educator and researcher, George Seimens, currently at University of Texas at Arlington; and researcher and commentator, Stephen Downes, National Research Council of Canada, designed and taught the first MOOC (massive online open course) for their class Connectivism and Connective Knowledge (also known as CCK08). Twenty-five enrolled students and another 2200 open-online participants engaged one another through blog posts, discussion threads, and a variety of open web resources. Contents of the course was presented and aggregated via RSS feeds, allowing the class to function similarly to many online communities which are often very dynamic and with control decentralized. In 2011, I became involved in DS106, an open online course on digital storytelling with a similar pedagogical structure to Seimens’ and Downes’ MOOC. Participants could contribute to the construction of the contents of the class, as well as create work shared via blogs and a variety of social media networks. I soon began teaching a version of the digital storytelling course for students at York College, but that also engaged learners from around the world. The MOOC as an online education phenomena gained momentum and hit mainstream culture by 2012 when top tier colleges and universities around the country began using them. Companies like Coursera and Udacity were founded out a belief that the MOOC model could disrupt traditional models of teaching and learning in higher education. But the efforts of these groups did not incorporate the ‘connectivist’ pedagogies of the MOOC introduced by Seimens and Downes. Rather they resembled traditional knowledge transmission model, with tightly controlled syllabi, lecturecasts, online quizes and autograding. Unsurprisingly the completion rates were abysmally less than 10% on average. As the hype around MOOCs took hold through 2012, the attention received by these ‘celebrity’ institution’s efforts was quite dismaying and topic of regular discussion among technologists and open education thinkers. I had a habit of contributing to conversation by regularly creating satirical GIFs, images, and designs which became part of presentations and discussions on MOOCs around the world. Most used was the ‘Day of the MOOC’ GIF which is a remix of image created by David Kernohan, which uses a frame from Monsters vs. Aliens. There’s some additional MOOC mania images and links below. Besides MOOCs, I comment on other technologies, primarily connected to education by lampooning the unified platform for all things CUNY, known as CUNYFirst, critiquing 3D Printing of weapons, and Battling Edtech Cyborgs with Domain of One’s Own. ‘Making Sense of MOOCs’ and standing on the cliff of the Peak of Expectations. The MOOCs are Coming! 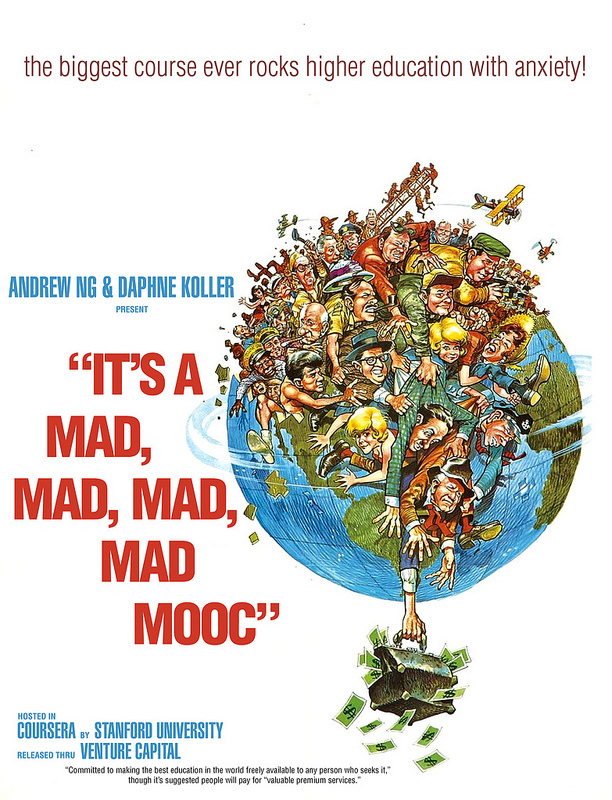 They MOOCs are Coming! La chronique : l’histoire est-elle soluble dans les MOOCs ? Mooc : la standardisation ou l’innovation ?